Put a Stop to Australia's Plan to Kill Feral Cats ! ! ! 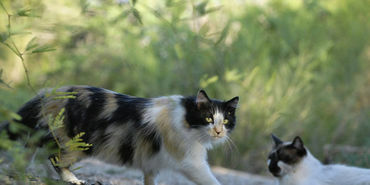 Australia will begin researching a virus to kill feral cats. The government has endorsed an eradication plan, and research has began in finding a safe and targeted form of biological control. Signed.Not only the right wingers ,the looney left are just as keen They are influenced by kill crazy environmentalists who would kill off all non native animals.Luckily so far they have not found a substance that will kill only cats.Let's hope they never do. Australia needs to take some lessons from US-based Alley Cat Allies. Trap and sterilize feral cats, then feed them regularly to reduce their impact on wildlife. Killing them will result in the "vacuum effect" - new cats will come along to replace those that have been removed. Signed this morning, October 23. Signed, shared and noted. Thank you, Cher. Noted & signed in protest. I just signed. This is an insane plan and won't solve the problem. Signed. Although I must say, wildlife suffers because of cats. Cats are not native to Australia; this is what happens when you mess up with nature in the first place. There should be stricter rules on indoor cats to help wildlife.